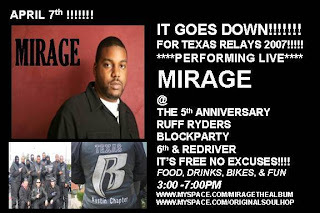 Mirage wrote in to tell us about his show @ the Ruff Ryders Texas Relays Party @ Dirty Dog Bar on April 7th! The Relays are here again... get ready for some good times. The Clyde Littlefield Texas Relays are an annual track and field competition held at Mike A. Myers Stadium in Austin, Texas. The University of Texas serves as host for the event, held on either the first or second weekend of April. Events are held in High School, College, University, and Invitational divisions. 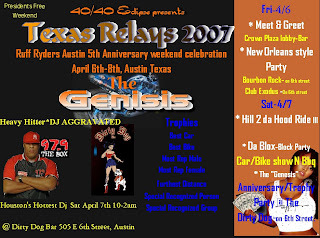 The 80th running of the Relays will be held from April 4-7, 2007. In response to cold-weather conditions at the Kansas Relays,  the Texas Relays started as a men's-only competition in 1925 by coach Clyde Littlefield and athletic director Theo Bellmont. The Relays were held at Memorial Stadium until Myers Stadium was opened in 1999. The meet was not held in from 1932-1934 as a result of The Great Depression. Women's events were added in 1963. To encourage attendance in the early years of the event, various publicity stunts were staged. The most successful was a 1927 stunt in which three Tarahumaras were invited to the Relays. These men were famed as runners who never stopped running. A race was staged between the men from San Antonio to Memorial Stadium. After 14 hours and 53 minutes, the 89 mile race ended in a tie.